Made for the Japanese market, this model only comes in a lefty. Fireglo finish and reproduced to the exact specs of Paul McCartney's 1964 4001S. 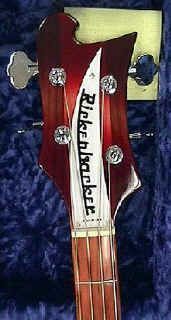 For the next while he used his Ric bass incessantly in videos and in the studio, until the end of 1968. Earlier in '68, Fender gave the Beatles a some FREE equipment but not as much as the rumours say. I´d like to refer to a long and extensive article by Phillip Kabuki who actually made the Rosewood telecaster. It is one of two RW strats and teles made in the fall of '68. George got one tele and Jimi Hendrix got a strat and tele. Fender still has the other tele. George's tele was flown on a BBC coach seat and delivered to the EMI studios in December 1968. In the summer of '68, Don Randall gave the Beatles one silverface Deluxe, a silverface Twin, and a suitcase model Rhodes piano. There were no guitars given away. Mal Evins purchased two Sonic Blue strats in Sheffield for John and George during the Help! sessions. Epstein agreed to pay as long as the guitars were identical. Paul bought an Esquire (tele with no neck pickup) during the Revolver sessions. He also purchased a RH Fender Jazz bass and Fender piggyback Bassman in '66. The amp saw service on some of the Pepper cuts and was used as late as the recording of Abbey Road. The Jazz bass was used on many of the White Album cuts. George favored this bass - restrung for to normal on the Abbey Road cuts where he played bass. 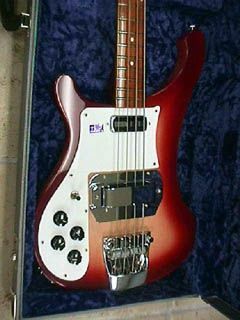 Paul also used this bass in Nigeria when he recorded Band on the Run. George purchased a white tolex piggyback bandmaster during the Rubber Soul sessions which was used on various recordings through 1968. The only other Fender was the Bass VI purchased in London in '68 for George and John to use while Paul played keyboards. Eric Clapton suggested it, as Jack Bruce used to play one. Feeling that the summer of love was far over and the pschedelic movement moving on, John decided to have the his paint job stripped from the top of his J-160. He liked it so much that he did the same to his Epiphone Casino. 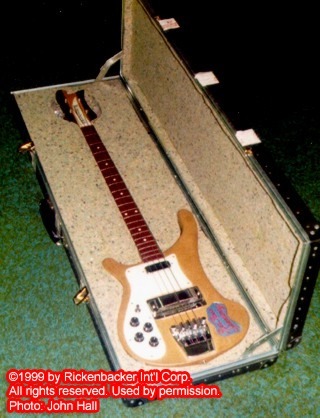 Paul following John's lead did the same to his Ric bass. That's why we don't see his bass in the "Revolution" video because he doesn't have it. If you've ever seen photos from behind the scenes at the 'Revolution' video shoot you can see his Fender Jazz Bass is present along with his old Hofner Cavern bass. Paul McCartney´s 4001S with the Red Rose Speedway sticker.